I find I’m always trying to recreate restaurant dishes at home and I just now realized why. My grandma used to do that. She was incredible in that way – in so many ways. She could reverse engineer just about anything and without the internets! Oh man, I miss her so much. Sometimes I forget she’s gone because she’s such a part of me. But I guess I didn’t inherit her amazing ability to deconstruct and reconstruct dishes like agedashi tofu because I just went to the interwebs and found a recipe. Aside from the frying, which always makes me cringe because of the mess it makes and the increased potential for injury, it’s super easy. I think the hardest part was hunting down the ingredients like dashi, bonito flakes, and daikon radish. But if you have access to an Asian grocery store, you might be in luck. Just be sure to get silken tofu and not the firm or even medium tofu. Cut it into cubes (technically, mine are rectangular prisms and not cubes, but whatever), blot dry, then give it a roll in the cornstarch just before frying. Fry to a light golden brown. I think if you try to fry to a true golden color, you’re going to be 1) waiting a long time and 2) probably burning the heck out of something. Light golden brown is fine. Heat the tentsuyu ingredients together without boiling. 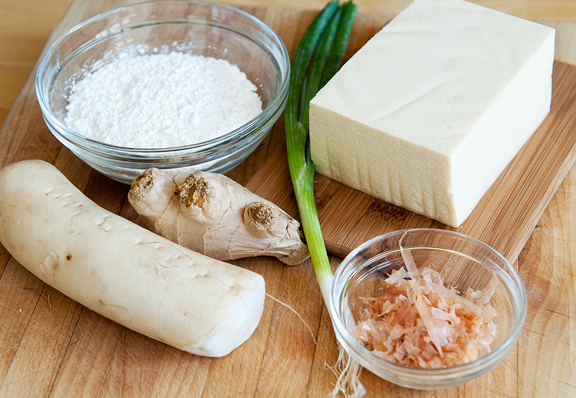 Set a few cubes of tofu into a bowl, pour the tentsuyu over it, garnish with the ginger, daikon radish, and bonito flakes. That’s it! So easy and so very comforting. It’s like time spent with Grandma. Combine the tentsuyu sauce ingredients in a small saucepan and heat until steaming, but not boiling. Heat about three inches of oil in a medium saucepan. 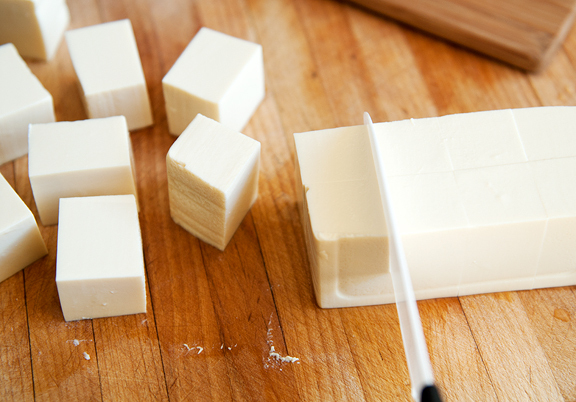 Slice the tofu into 1-inch cubes (or a little larger like 1x1x2 inches). 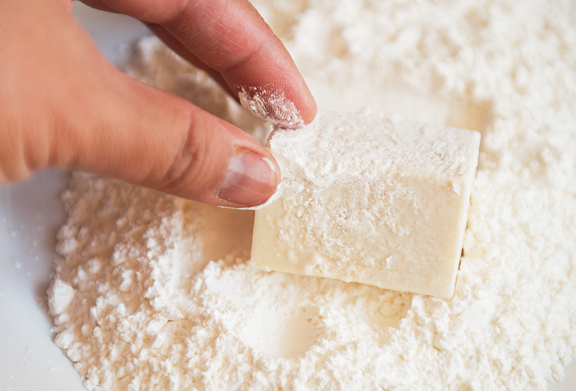 Pat them dry with a paper towel and then coat them in cornstarch. 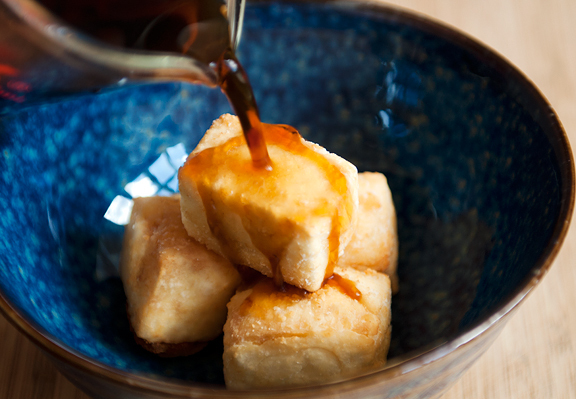 When the oil is hot (flick some cornstarch in and when it sizzles, it’s ready), carefully drop 3-4 cubes of tofu into the oil to fry. When the cubes start to turn a light golden color, flip them in the oil until each cube is a light golden color all over. 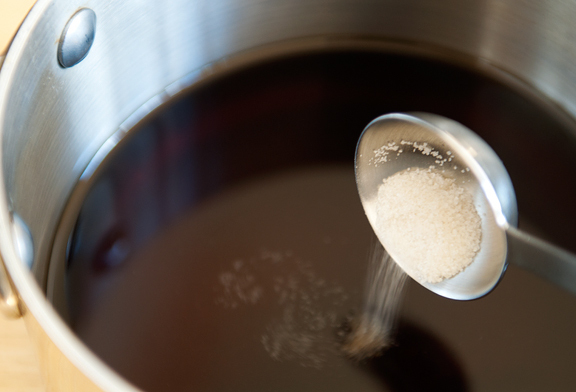 Remove from the oil and set on a paper towel or cooling rack to drain a little. Repeat until all of the cubes are fried. Place 3-4 cubes in a bowl. Pour some tentsuyu sauce over the tofu. 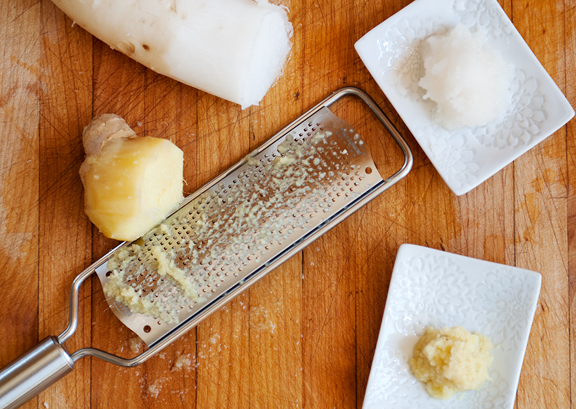 Top the tofu with a pinch of the grated daikon and ginger. Sprinkle bonito flakes over top and garnish with some green onions. Serve hot. 8 oz of tofu should make enough to serve four as a light appetizer. i love this dish, can’t wait to try! Best wishes to, Tara. May she have great success with her endeavor. Oh this looks absolutely perfect! I hate frying too…time to get over it I guess. Finally, I know the secret to crispy tofu! Cornstarch! Squeezing all of the water out of it just enough. Thanks for the tip, and for the beautiful post. what would you put in to make it a spicy sauce? i have had it like that before and it was awsome. I’m afraid of deep frying so never do it. The dish sounds wonderful though. Lovely photo of the tofu against the blue dish. Brilliant, I’d love to try this but I just can’t get my head around the texture of tofu LOL. I did not realize that the tufu is coated with cornstarch. What a relieve. I thought it had to be something fancy. it will definitely in my try out soon b/c it is one of my faorite food. I had Agedashi Tofu on Tuesday during a marathon sushi session and it was wonderful. And now you have given me the recipe I will have to give it a go! Margie – this one is pretty easy! Melanie – maybe slice up some jalapeño pepper or thai bird chilis? barbara – thank you, my friend. Perfecting Pru – it’s so nice to be able to make it yourself! This is one of my absolute favorite Japanese dishes. I haven’t had much success replicating it so far, but I will try your recipe. Also, I’ll definitely be getting your friends book. 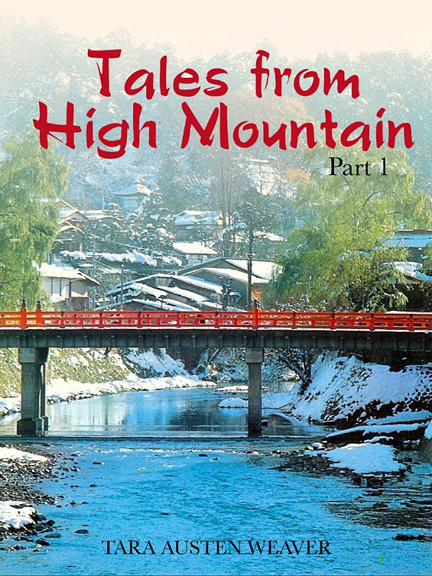 I used to live in Japan and I love reading about the experiences that others have there. Also, I think it’s great to be supporting the relief effort there as much as possible. There are still so many people who need help. Yum, yum, yum!!!! 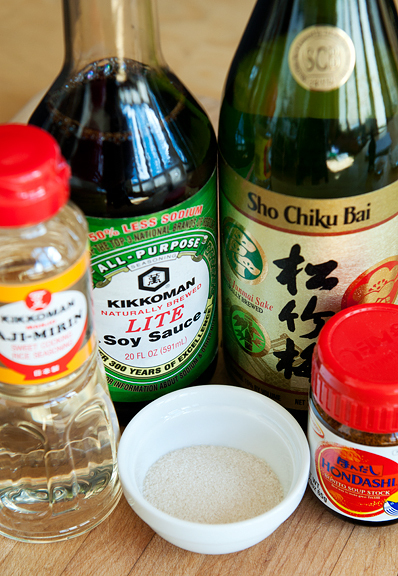 I think the closest asian market is at least an hour away here, but consider this bookmarked! Do you think you could fry these in a deep cast iron skillet? When we’ve attempted agedashi before, we’ve never been able to get the oil hot enough and it’s turned out soggy. Do you think the cast iron would help?? Callie – I’m sure you could. If that works for you, then go for it! 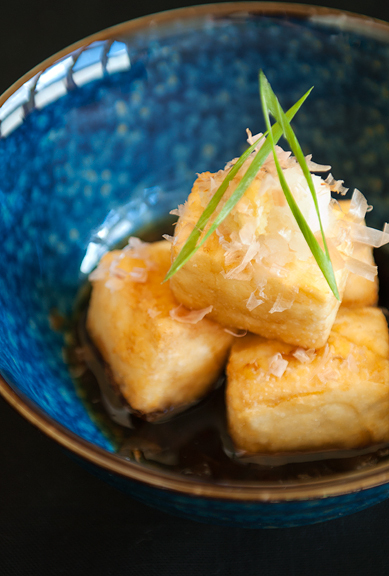 My boys LOVE agendashi tofu at Japanese restaurants and were THRILLED when I made it at home! Your recipe was simple and DELICIOUS!!! Thank you!! First off, my hats off to you for this wonderful recipe! I’ve been consuming and loving agedashi tofu for years but never attempted to replicate it at home – I envisioned it as: Me + soft tofu + frying = kitchen disaster. That is, until today. I stumbled on your site, got inspired by your post and photos, had all the ingredients, and I thought “why not? !” WOW! Delicious. I am giddy like a kid knowing I can make agedashi tofu! Thank you so much for posting this! I am an instant fan!